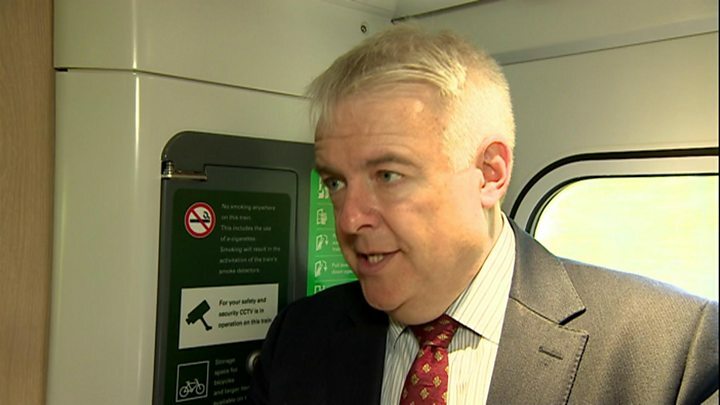 Media captionCarwyn Jones: "It's not going to happen overnight"
Rail passengers on local services in Wales have been warned by the first minister that substantial improvements could be three or four years away. A new operator to run the Wales and Borders franchise for the next 15 years is due to be announced this month. Carwyn Jones said the standards of outgoing operator Arriva Trains Wales had not been good enough. He said it was "going to take some time" for new carriages and electric services to come through. Speaking at the opening of a revamped station in Bridgend on Monday, Mr Jones warned that improvements were "not going to happen overnight". "If people are asking me when we are going to see real changes, I would say the beginning of the 2020s," he added. "In three to four years' time that is when people will see real change in the service, when everything begins to fit into place. "The last time the franchise was let, clearly to my mind standards were not as high as they should have been. "We want to make sure standards are higher now, and whoever is successful in getting the new franchise they provide a far better service in terms of frequency and reliability. "Using 40-year-old trains is not acceptable any more". Two of the four companies which submitted bids in 2016 to run the Wales and Borders franchise from 2018 have since dropped out - Arriva being one of them. The Welsh Conservatives' economy spokesman Russell George said: "This is half the world away from the brave new era in rail travel that we were sold, and the first minister's comments will be of serious concern to long-suffering passengers. "The new franchise must improve rail transport standards across Wales - and this downplaying of expectations simply isn't good enough." Plaid Cymru's Adam Price said: "The First Minister's comments perfectly summarise Labour's record in government in Wales. "They promise the people of Wales the world but in reality all they have been able to deliver is at best, incremental improvements or at worst, managed decline." What's wrong with Wales' trains?